Over the last several decades, bicycle design has gone high-tech, with ultra-light frames, better brakes and derailleurs, and, on mountain bikes, outstanding suspension systems. Today, literally anyone should be able to find a bike that meets their needs. If you are in the market for a new bike, one of the first questions you must answer is where you plan to ride: on paved roads, or off-road on dirt paths. Road bikes and mountain bikes are vastly different. Because mountain bikes have suspension systems and sturdier frames and wheels, they are heavier than road bikes. And what about cost? Well, you can pay thousands of dollars for either type, if you are willing. You can easily spend $1500-2000 for an "above-average" mountain bike and elite racing bikes can run $5000 and up. You can't go as fast as your body can propel you if your bike doesn't fit. Once you find the magic seat, handlebars and pedal position, your body feels as comfortable after one hundred miles as it does after 10 miles. So how do you know it fits? Unfortunately, there seems to be a bewildering combination of measurements when it comes to bicycles. For example, isn't it odd that a 31.8-mm derailleur clamp fits a 1 1/4-inch-diameter tube? Most bicycle dimensions are in metric, but it's not uncommon to find a stem dimension reported in millimeters and the fork steerers it is supposed to fit stated in fractional or decimal inches. And, you could order a 700C, "23-mm" Schwalbe Ultremo tire for a road bike and a "1.35-inch" Kenda Nevegal for a mountain bike. There are a number of reasons for the mixing of metric with imperial weights and measures. Ever wonder why the measurement for a seatpost is 27.2-mm and not an even 27mm? It's because metal tubing is drawn to international inch standards in order to ensure that a tube purchased from France will support the same loads as one bought in Japan or the USA, and that tube A will slide into socket B throughout the world. The 27.2-mm post is a perfect fit into a standard 1 1/8 inch steel tube with a 0.028-inch wall thickness. The four most popular frame sizes (54, 56, 58 and 60 centimeters) are duplicates of the once-dominant inch-standard sizes (21, 22, 23, 24 inches), rounded to the nearest centimeter. In the bicycle industry, however, all of these dimensions are expressed in metric increments. The reason for this is that almost every bicycle made is produced in a country where the metric system is used exclusively. Because the bicycle business is international, it makes sense to use the numerical language that is fluently spoken in all but three countries. That said, long-standing inch standards persist, even in France, where great care is taken to erase all evidence of foreign influence. Steerer tubes and headsets are universally expressed in inches, and the roller chain and sprockets are 1/2-inch-pitch (ie., distance from pin to pin). Standing over the top tube and measuring the gap between the tube and your crotch used to be a good method of frame sizing for a traditional diamond-shaped bike frame. One inch of clearance or less between the top tube and your crotch was a decent way to determine if the bike was the correct size. With today's non-traditional frame designs, standing over the top tube and measuring the gap between the tube and your crotch goes out the window. There is no frame sizing that is considered "standard," and using the manufacturer's measurements may not help either. Some frames now come in just three sizes -- small, medium and large. This sizing range is great for manufacturers -- as they only have to produce three frame sizes. However, it leaves gaps in sizing and makes it difficult for some riders to get a good fit. Each manufacturer may measure their frame size in a different way and from a different point. For example, some brands measure from the center of the bottom bracket to the top or center of the top tube, while others measure to the top of the seat tube. Compact frames may use a "virtual top tube," and even this point of measurement may vary from manufacturer to manufacturer. The net of all this is that a 51 cm bike from one manufacturer may be different than a 51 cm bike in another brand; therefore, it is important to define the sizing method used. Manufacturers generally post sizing guidelines, or, at the very least, geometry specifications on their websites. Because correct sizing is based on your inseam measurement, it is important to know that measurement. This can be done by standing bare foot with your back against a wall and placing a one-inch thick book between your legs with the spine snug against your crotch. Make sure the book is flat against the wall forming a 90 degree angle between the wall and top of the book. Now measure from the top of the book to the floor. For a road bike with a conventional frame, the frame size should be approximately two-thirds of your inseam. So, take your inseam measurement in centimeters and multiply it by 0.67 to determine your frame size in a traditional road frame. Manufacturers size their frames to accommodate the normal proportions of reach to leg length. If you are outside of these proportions, finding the correct frame or bicycle to fit you will be more difficult. Take your height and divide it by your inseam. If the value of this is more than 2.2, you will need a bicycle with a longer reach or top tube. If the value is less than 2.0, you have longer legs and will need a shorter reach or top tube. Generally speaking, bicycles with a steeper seat tube angle will have a longer effective top tube length. Top tube length can be adjusted to an effective length using different size stems, but this can also affect handling. It is important to be in the correct frame for your body type and the type of riding you will be doing. 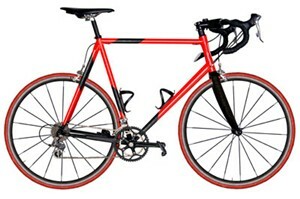 The web site www.CompetitiveCyclist.com has an excellent tool to help you determine the correct size frame for your body. Click on "Fit Calculator". Top tube length is especially important for women. Women generally have shorter torsos and may need a relatively shorter top tube than male riders. The problem for women triathletes is that pretty much every stock bike on the market is designed for a man, and the arms forward position needed for triathlon time-trials only exacerbates the differences between a male and a female -- and not in a woman's favor. This is because the top tube of the bike, the tube that runs between the seat and the handlebars, is made for a man's longer torso and longer arms. Not only does a woman endure more pain in her back and shoulders from this hyper-extended position, she also can't generate as much power as she could if her torso was in a more compact position. This is where "women-specific" designs come in. These bikes feature shorter top tubes that make it easier to reach the bars. (This design may also be appropriate for men with shorter upper bodies or riders who prefer a more upright position.) Manufacturers such as Cannondale (www.Cannondale.com), Specialized (www.Specialized.com), and Trek (www.Trek.com)each produce bikes specifically designed for women. If you're a woman who's too tall to fit on a women's frame -- most bikes designed for females are much smaller than bikes sized for the average male -- ask your local bike shop which bike manufacturers use shorter top tubes in their bike lines. Even within the men's category, there are frames that are longer than others, and if you pick a brand that uses shorter top tubes, you might find a nice fit. When it comes to using a men's frame, do your arms and shoulders a favor and bolt on a highly adjustable set of aerobars. You want to find a pair that can be shortened enough so that when you drop into your aero position with your hands forward and your back flat, the upper arms and torso make a 90-degree angle. This angle provides the most comfortable support for the upper body in the aero position. And don't think that just because you purchased a tri-bike, fully rigged with aerobars, that you don't have to worry about fit. Triathlon bikes -- again, designed for men -- are even more challenging for women to feel comfortable riding. With one of these race rockets, you may have to throw out the stock bars that came with the bike for one that can adjust to your shorter top half. Of course, the ultimate and very pricey answer for a woman trying to find comfort on a bike is a customized frame -- built to her exact measurements. For some women, this route may indeed be the only option. A six-foot tall woman may be taller than the average male, but her female proportions mean that she won't fit on even the biggest stock frame. Once you do find your perfect set of wheels, understand that your body still needs to "learn" the time-trial position. When you're torqued over with your arms on your aerobars, you're tapping new muscles in your back and relying on more of your glutes to motor you along. Until you build up those muscles to handle the workload, you may not produce any noticeable increases in speed. Given time though, you'll adapt and soon start piling on the miles faster than you ever thought you could. • If you are buying a new bike, check the frame sizing on the manufacturers' websites before purchasing one. If you are on the cusp between two sizes, give them a test ride to determine which one feels better. A reputable shop will not sell you the wrong bicycle size. • If you are purchasing a used bike, go to the manufacturer's website and look up your model. If it is no longer listed, you can send the manufacturer an email or take it to a coach or an experienced bike fitter to determine if it is right for you. The great deal you got on a used bike will not be such a bargain if it is uncomfortable and you cannot produce power. • Find a good bike shop. A good bike shop that carries multiple brands will refrain from simply "eyeballing" measurement, and rather look up the correct frame size for your inseam. • Model/Design: First, figure out if you plan to ride mostly on paved roads, or, if you plan to ride on trails. This will determine the general type of bike to buy. Consider a recumbent bike if you experience multiple problems from biking (eg., erectile difficulty, lower back pain, wrist pain, finger numbness). • Size: Next, make sure the bike fits you. Go to a reputable bike shop and have them recommend the best frame size for your height and leg length. Have them help you set the best seat position if you cannot do this yourself. • Seat: Even though there is still some controversy on the relationship between seat design and impotence in cyclists, I recommend that men get a seat with a mid-line groove. Also, pay attention to seat width, too. One study shows that seats that are 9.5 cm wide or wider produce lower perineal pressures than seat widths in the 5.5-7.5 cm range (Spears IR, et al. 2003). Women, because they often have wider hips than men, should get a seat designed for them. • Accessories: If you plan to do a lot of long-distance riding, think about elbow rests or foam pads for your handlebars. Also, a bottle-holder and a trip-meter are very handy. • Other Gear: Consider biking gloves, biking shorts, and a good helmet. If you want to ride in organized rides or races, a helmet is often a requirement for participation. 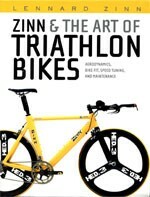 Lennard Zinn has published several books on bikes. And he knows his stuff. He earned his degree in physics. After college he was a member of the US Olympic Cycling Team. He has been building custom bike frames since 1982 in his shop in Boulder, CO. His latest book is: Zinn & The Art of Triathlon Bikes. Serious cyclists may want to look at www.CompetitiveCyclist.com. This web site sells road bikes, mountain bikes, and triathlon bikes. Cannondale (www.Cannondale.com) and Trek (www.TrekBikes.com) both have features on their respective web sites that allow you to compare the features of 2 of their bikes in a table. If you need cycling-related gear, check out www.TotalCycling.com. This company is based in Northern Ireland. 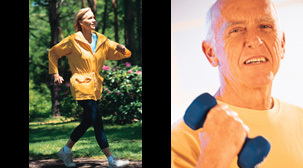 Stan Reents, PharmD, is available to speak on a variety of exercise-related topics. He also provides a one-on-one Health Coaching Service. Contact him through the Contact Us page. Stan Reents, PharmD, is a former healthcare professional. 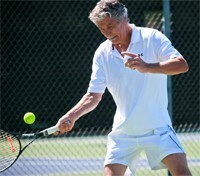 He is a member of the American College of Sports Medicine (ACSM) and holds current certifications from ACSM (Health & Fitness Specialist), ACE (Health Coach) and has been certified as a tennis coach by USTA. He is the author of Sport and Exercise Pharmacology (published by Human Kinetics) and has written for Runner's World magazine, Training and Conditioning, Club Solutions, and other fitness publications.